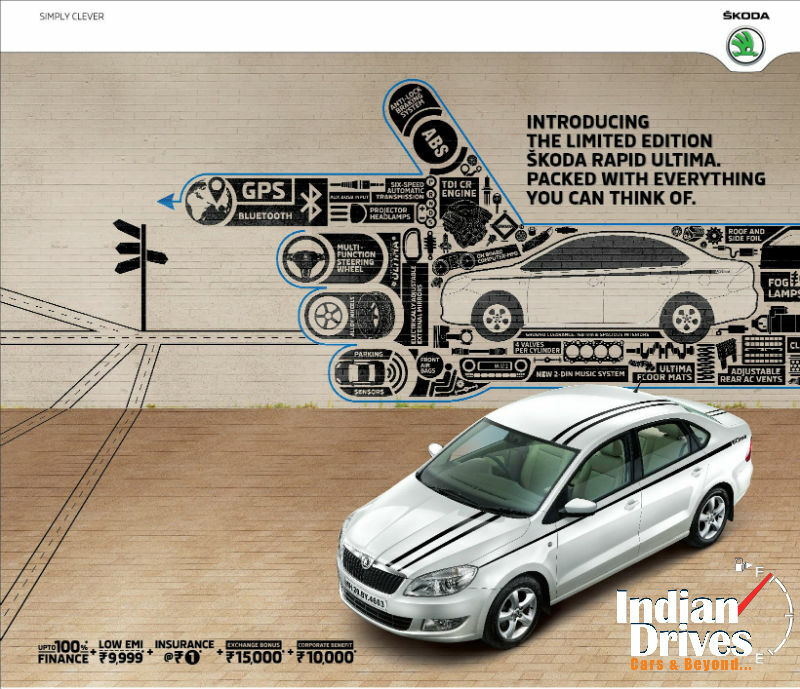 Skoda Auto India introduces ‘Rapid Ultima’ a special edition within the successful Rapid model range. The Ultima will be available in two variants and will be priced starting 8.3 lakhs ex-showroom New Delhi. The ‘Rapid Ultima’ will be available across all Skoda authorized dealerships from March 1st, 2014 for a limited period only. The Rapid Ultima will visually differentiate itself with an attractive exterior decal stretching from the hood over the roof all the way to the boot and across the shoulder line of the car. The Rapid Ultima which features Skoda new logo will be available in diesel and petrol variants across the Ambition Plus and Elegance trims. The petrol variant has maximum power of 77kW (105PS)@5250rpm with maximum torque of 220NM @153-3800rpm. The diesel variant has maximum power of 77kW (105PS) @4400rpm with maximum torque of 250Nm@1500-2500rpm. Symbolizing Skoda’s brand value – “Simply Clever”, the Rapid is ideal for the Indian streets with an attractive design, ample space, excellent safety equipment and modern proven technology. It is a comfortable car for the family with an elegant design, ensuring an efficient drive. The new features will now make the Rapid Ultima an even more enviable purchase within the already successful Rapid model range. 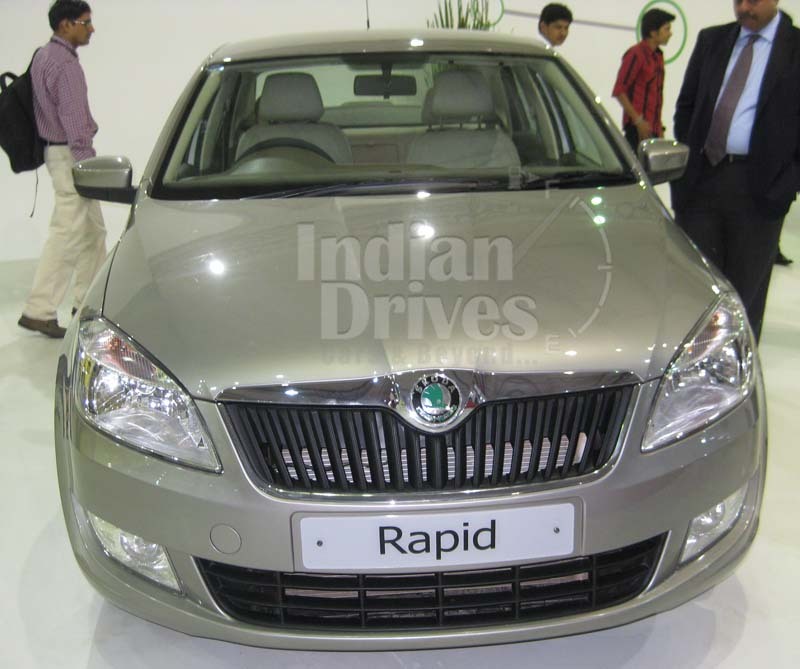 Skoda Rapid now got a revision for its whole range. The Czech based carmaker has made available the Active, Ambition Plus and Elegance trims of its entry level sedan in the showroom, which earlier were discontinued. The equipments remain the same as they were there earlier. On specifications, Ambition Plus trim equips kits like dual front airbags, steering-mounted controls, a leather-wrapped steering wheel, gear-shift and hand-brake lever, Bluetooth and USB compatibility. For the upper hand of range i.e. Elegance trim, Skoda has added the 15-inch alloy wheels, climate control and projector headlamps to the aforesaid package. In short, as we too are well informed with the fact, Rapid is in the need of hard push to conquer the market captivation. To its results, a good numbers of 2013 model cars are still available with the dealers in their stockyard, which they will roll it off for a hefty discount. So those who are looking to buy a Skoda Rapid this season, can crack the deal for a quite least-expensive amount. The carmaker has given a mild facelift to Rapid in the October 2013, so no to worry of feeling outdated with that year’s match. Just some moments before, Skoda launched the new Octavia on Indian shores with a lot of fanfare. Now a report surfaced on internet claiming, Octavia’s younger sibling ‘Rapid’ is going to get a coupe version somewhere in 2014. However, a year back the Theophilus Chin released the rendering image of same vehicle, which is claiming of lending more of its stakes to the production specific coupe. Well, the new Rapid coupe of 2014 seems to be looking like that of a celebration assortment for the completion of 30 years of ‘Rapid coupe’ that was launched in 1984. Moreover, the report on internet claims, platform underpinning it would be borrowed from that of the Rapid sedan. And a range of engine options ranging between multiples TSI and TDI would be engulfing its bay. To the competition, this Rapid coupe will be a direct competitor to the Renault Megane Coupe. Apart from the gist, we learnt from a rumour, Skoda and Volkswagen are working on a 1.6-liter TSI turbo with 180 PS that would replace the 1.4-liter Twincharger. Being famous with the carmakers like Maruti, now the term “special edition” gets attached with the Skoda too. This time it is the younger sibling of Czech carmaker who is bestowed with the same. Leisure edition of Rapid will stay on shelf across the country for a limited period only, and is made available in both 1.6 petrol (AT & MT) and diesel (MT). The petrol motor produces maximum power of 105PS with maximum torque of 220NM, whilst the diesel variant gains 105PS at the best against the 250Nm of maximum torque. 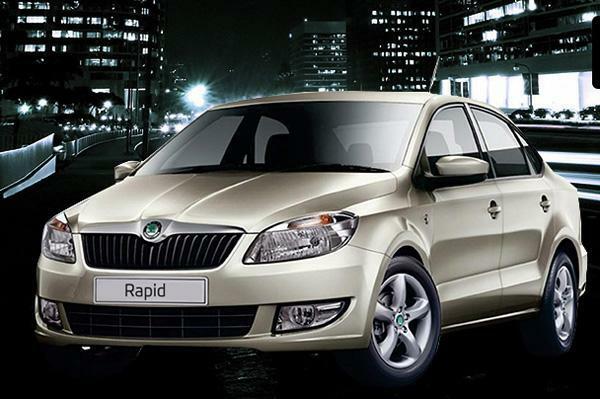 Representing SKODA’s brand value, the Rapid is a blend of dynamic handling and refined engineering. Skoda Auto, the fully subsidized arm of Volkswagen Group, has launched innovative versions of its best selling sedan Rapid, i.e. Active Plus and Ambition Plus. The newly rolled out models consist of latest traits, which further append to the expediency of its clients. The car manufacturer made entry in the Indian auto zone during November last year and since that time, it is working in enthusiasm to provide the most inexpensiv eitems with superior utility to its customers. Skoda happens to be the bestever growing car manufacturer of Europe and perhaps in the Indian market as well. Skoda Auto has set up a forward-looking production division in Shendra near Aurangabad, Maharashtra that covers up a region of around 300,000 square meters. At the moment, the car manufacturer has provided five models in the India comprising Yeti compact premium Sports Utility Vehicle (SUV), Laura executive sedan, SKODA Superb premium sedan, Fabia hatchback, and the newly launched entry-level sedan Rapid. The company has continued a sturdy dealership system of 106 showrooms crosswise the country’s length and span and has presented over 1,57,857 vehicles in the nation since December 2001. With the aim toentice a large sum of purchasers during festival period, Skoda India has launched a new plan. The auto manufacturer has determined to bring in new versions in its Rapid sedan’s array, Ambition Plus and Active Plus. This progression will permit the purchasers to pick their preferred Rapid from a handful of alternatives present in the Indian automobile business. These Plus edition cars will posses sextracharacteristics that will append to the expediency of its passengers. The effort of Skoda India is not novel as several car manufacturers are adopting the relatedstyle by adding innovative vehicles in their subsisting model array with extra characteristics and a revitalized look. These moves capture the interest of masses around festival period that is said to be a good time to make investment in new products in the Indian market. All hands on deck for the compact sedan enthusiasts of Europe. 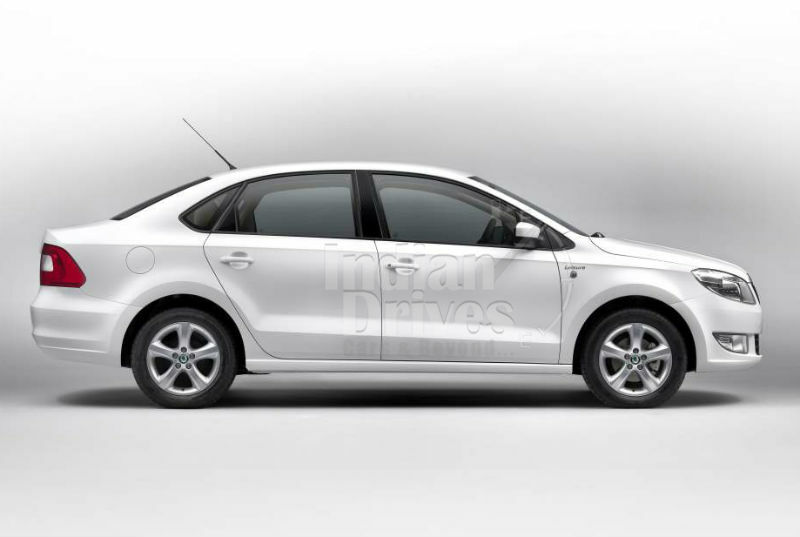 The Skoda Rapid will be available at the dealerships for buyers by the end of this very year. Skoda Rapid has made its way above the well-known hatchback Fabia which was offered by Skoda couple of years ago, and lies below the powerful Octavia saloon. Even though the compact sedan is to be released by the end of this year, Europe has already started airing TV Commercials for the Skoda Rapid. Pulled togetherby beautiful scenery and a happy couple driving over a glorious bridge in a majestic white Skoda Rapid. They reach their destination of a lovely home situated over the beautiful European roads. While the family shares a happy moment, the car stands out as elegant and stylish. This compact saloon isn’t just elegant and stylish, under the hood it has got a powerful 1.6 Liter engine which in turn gives you a sturdy 105 break horse power. Skoda released a particularly Indian styled commercial to promote the Rapid in India, which captured a very colorful, full of life and rich in culture wedding alongside with the Skoda Rapid making everything easier. The Skoda rapid was showcased at the Mission L concept, at the 2011 Frankfurt Motor show. As seen in the commercial, the compact saloon drives on a practically stretched version of the present Volkswagen Polo’s design. The car measures up to 4.48 meters long and 1.7 meters wide.The concept of the dashboard comes from the Volkswagen Jetta’s simple design that was previewed this past year at the Mission L Concept. The Skoda Rapid is designed to give you nice and spacious interiors, elegant features and cutting edge technology, very high economy and for the whole family to fit in, not to mention that it’s a very affordable car. And a very exciting rear boot lid that opens up like a hatch that offers better access to the back, unlike the model which is available in the Indian Market. This compact sedan is the first to fully feature the company’s new formulated design language. The car will be available in five petrol engine variants and two diesel engines, with a standard five-speed manual transmission as well as with a six-speed automatic transmission. So all in all the Skoda Rapid has made a breakthrough in sales in India, and will surely make it in Europe when it hits the showrooms this fall. 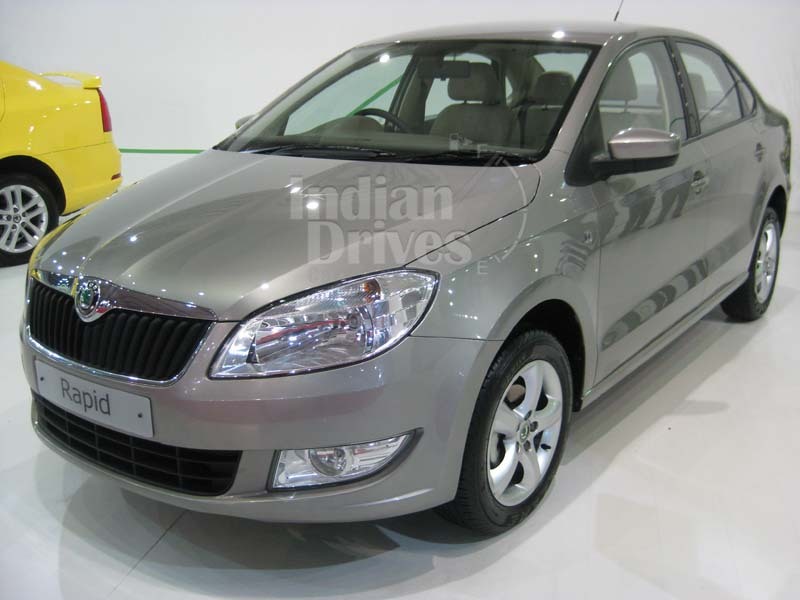 Skoda Auto India, which is in the Indian automobile market now since quite some time, is planning to expand its business in India in year 2012 with the launch of Skoda Rapid. 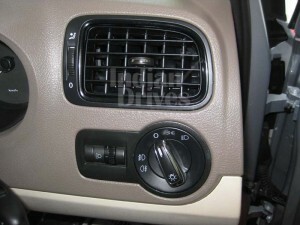 This model was unveiled at the 2012 Auto Expo in New Delhi. 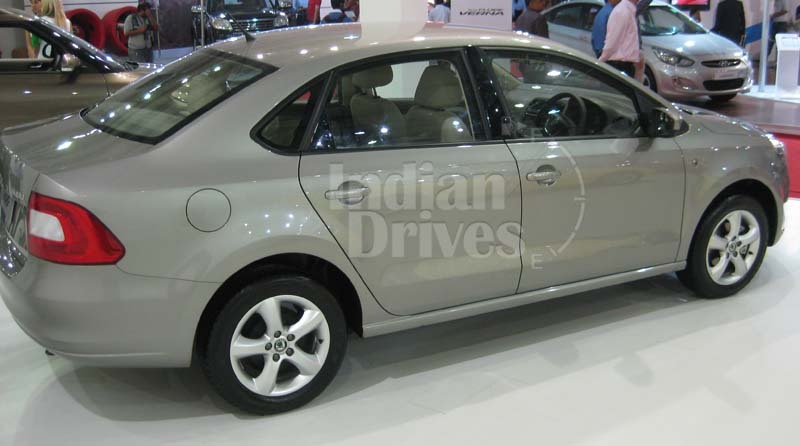 Skoda Rapid has been made keeping in mind the heavy duty use of a compact sedan in the Indian families, where it is used to commute between home and work places and on weekends for excursions. It is more or less used like a pickup truck in the Indian Weddings which tend to be always big and fat in almost every manner possible. Skoda has also showed its interest in the planning of launching a new model almost every six months in as the Indian automobile market is expanding exponentially. Skoda Rapid is coming in three variants, in which there are two petrol version, one with five-speed manual transmission, and another with automatic 6-speed, Tiptronic Manual Gear changing Transmission. The third is a diesel version which comes with a five-speed Manual Fully Synchronized Transmission, the same as the petrol variant, but with a different kind of fuel. Along with Rapid, Skoda has Fabia, a hatchback, Laura and Laura RS, the famous SUV Yeti and the luxurious sedan Superb to woo its customers and give a tray full of perfect options to choose from. In 2002 Skoda Octavia received the “Best Entry Level Car of the year” by BBC and started a legacy which was carried ahead with awards received every year by the cars of Skoda. To be precise, Skoda Rapid has received four Automotive Awards, which are the most distinguished awards from the Indian Media. This proves that the claim made by Skoda some time back that Rapid, the recently launched model is getting a very positive feedback from the market. The company is determined to raise their sales figure worldwide up to 1.5 million at least. Company is executing plans and making investments for its expansion of volume and make its presence more impressive in the International automobile market. In the year 2011 alone, company has seen a worldwide sales of 8,79,200 units, compared to 2012. This means, there has been a rise of 50 percent to 30,000 units in 2011, this is indeed an excellent benchmark figure for the company to advance itself toward more accomplishments in sales. Right now 60 percent of the manufactured cars are sold out in the European market and the rest 40 percent is sold in the developing countries. Now, Skoda has a different strategy and plan for this 60-40 ratio, where it targets to turn this upside down and make 60 percent of sales in the developing countries which are outside the European region of sales of Skoda by 2018. Anyone will admit that it’s a very ambitious and profitable thought of Skoda. Skoda has recently appointed Mr. Sudhir Rao as the Managing Director of India operations in Skoda Auto India. He has a very good understanding of the Indian automobile industry through his years of experience as a senior-level executive in this field. Skoda believes to carry onto the successful path it has traveled across in the past 10 years. Skoda has come up with an innovative way of promoting Skoda Rapid in the Indian market and has kicked off an Ad campaign under the name “Big Fat Indian Wedding” in order to lure the rich wedding customers in India. The advertisement starts with a majestic palatial house where a grand wedding is about to take place and one can see workers running around making the arrangements and a Skoda Rapid stands humbly outside. By this Ad campaign Skoda is mainly trying to highlight the fact that there is a strong connection between a family and the car they are travelling in. The car is also an integral part of the family and humbly takes the whole family for a ride. The backdrop of a big fat Indian wedding was chosen so as to throw light on the certain emotions that bind the family and the car together. Skoda follows the perception for “Built to be Thoughtful” while making its cars as they believe that a car is not just a piece of metal with ergonomics and four tires but it is also a part of the family of the person owning the car and Indian wedding are said to be exquisite and extravagant so in every wedding the car is decorated in a grand manner which then takes the bride and the groom. So in a marriage some of the credit goes to the car as well and Skoda Rapid understands the emotions it has to share with the family. 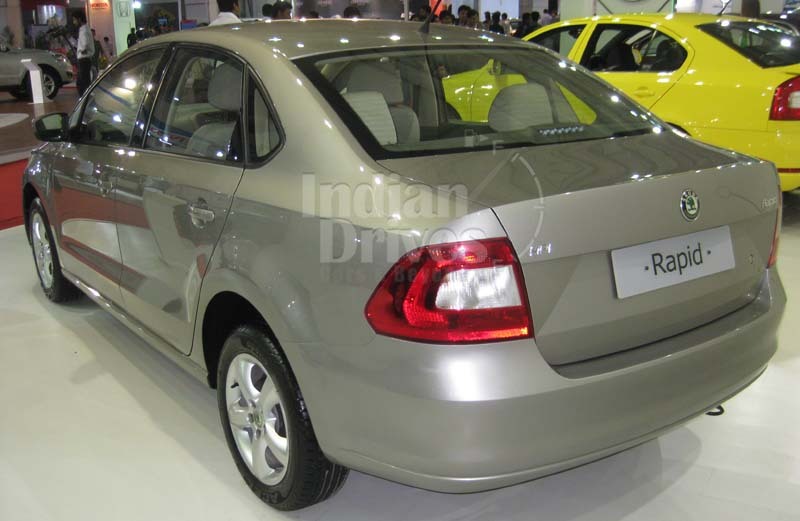 Skoda Rapid is perfect for an Indian wedding as it is luxurious and the looks given to the car have received appreciation from the critics as well as the crowd. Skoda Rapid has bagged the award for the Best Family car of the Year 2011 as told by Mr. Thomas Kuehl who is the head of Skoda Auto India and is also a member of the sales and marketing board of Skoda. Ergonomically the car has been upgraded to a great extent and the designers of the car have done a good job on the overall outlook of the car. 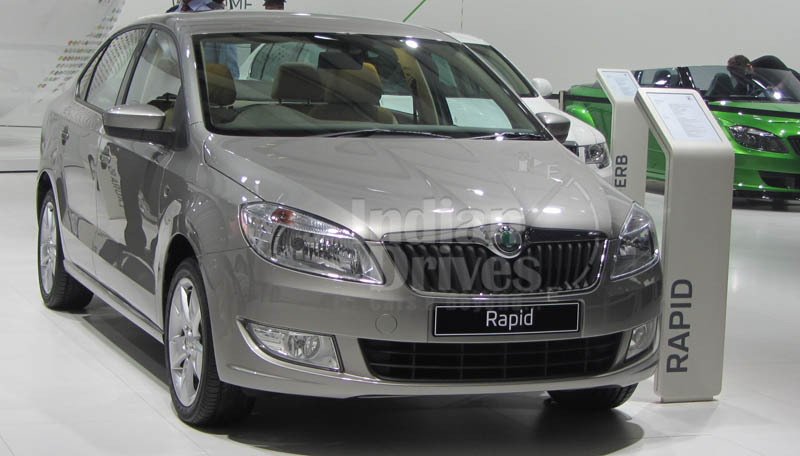 Skoda Rapid Car has been launched with high expectations in the C-Class car market segment in India and hopes to rope in demands from customers. Skoda has always been giving earmarking itself as a preferable brand in the Indian Automobile industry and will hopefully continue to make a mark. Skoda Auto India seem to have caught on the latchet of its parent company Volkswagen. Though VW dissuades all its sister concerns to follow its designing themes or stuff, eventually each and every product from its sister concern turns out to be a competition. Classic examples would be the VW Polo and the Skoda Fabia. Though Skoda as also the Fabia came in to India much before VW could, its eventually the Polo which is garnering all the attention and cash registers ringing for VW. Moreover, the Skoda Fabia isn’t a driver’s car as projected by some while the Polo is all a driver’s car. In between, VW extended the body of the Polo and brought in the Vento and met with the same success that Maruti met with the Swift and Dzire combination. Now, there are waiting periods for both the diesel Vento as also the Polo. 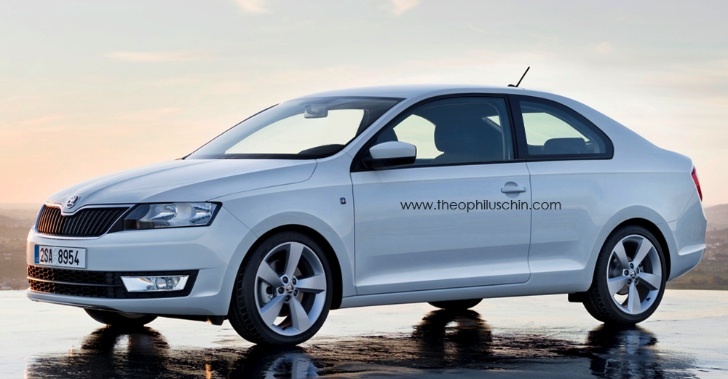 Now, Skoda has thought of a strange thing and that is building a sedan from its Fabia hatch. Initial estimates say that the sedan would be named as Rapid. 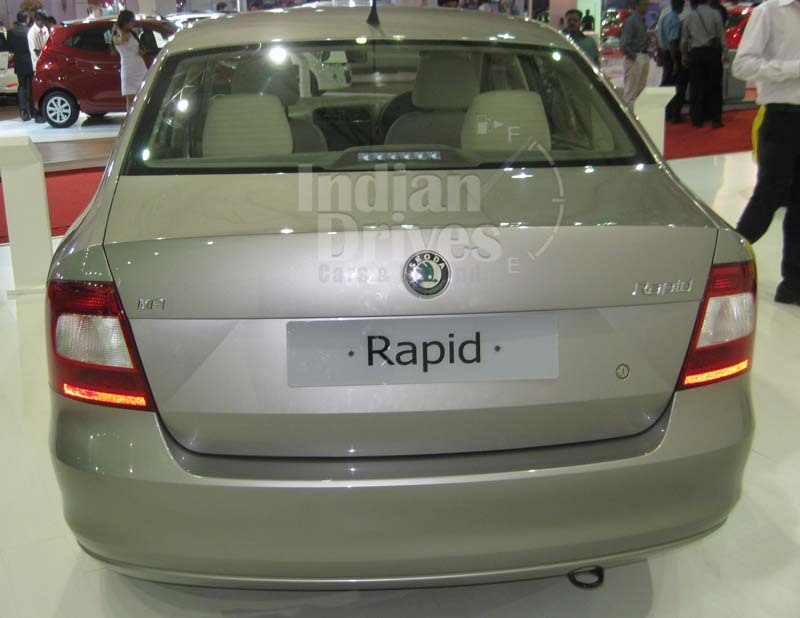 So, here is a preview of the Skoda Rapid in India and what all features it is expected to carry. As for the looks, while the Vento looks exactly like the Volkswagen Polo, the Rapid would be a bit different than the Fabia. Infact, it would be a mini Laura in its looks. 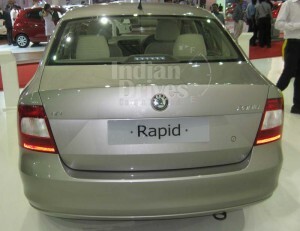 The Octavia wouldn’t be replaced and the Rapid would be Skoda’s answer to the Rs 5-8 lakhs sedan market. The grille would be in line with Skoda’s new design theme while the fog lamps would be bigger or similar to the one in the Superb. 15 inch wheels, as is the case of the Vento would be present. The car would definitely be distinguishable as the Rapid unlike the case where one cannot tell apart the Vento from the Polo, bang on. The rear would also carry a much polished job, similar to the likes of the Vento. 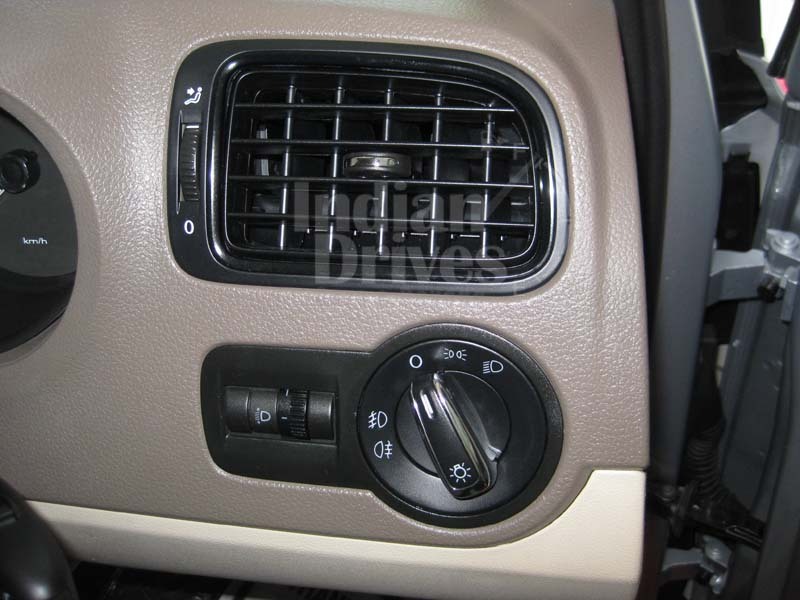 For the interiors, it is said that Skoda would introduce a start stop button, which would actually be to counter the one in the upcoming Nissan Sunny. Rest of the stuff would be carried over from the Fabia including seating position in the front, meter dials, HVAC and the likes. Considering that it would be a build to price sedan, it would not feature electrically controlled outside rear view mirrors, or electrical adjustment for the seats. 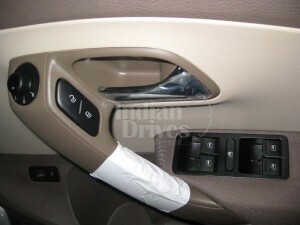 What would be commendable is the build quality of this car. The rear leg room which is also good in the Vento, would be even more spacious here. Boot space is also said to be very good. No rear AC vents though here. 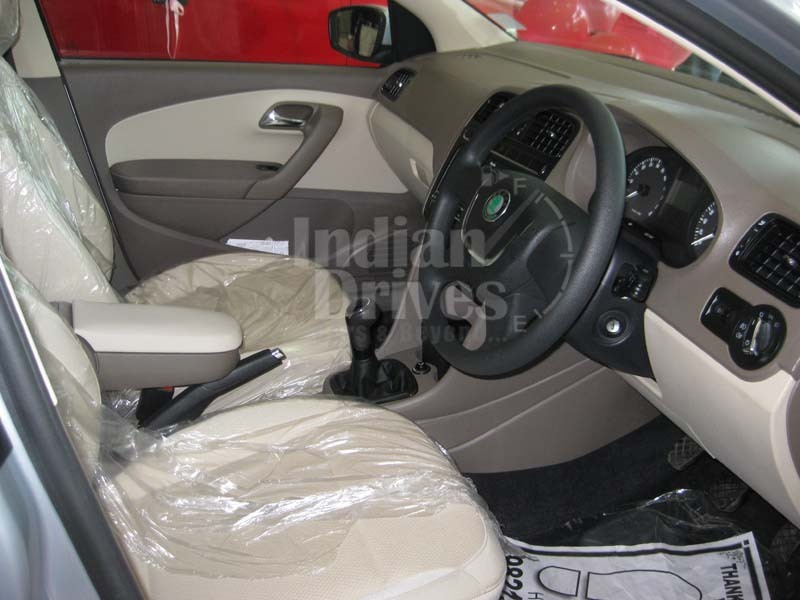 Upholstery and equipment is yet to be decided by Skoda Auto. However, no climate control would feature into the equation. If allowed, steering mounted controls may just find their way onto the Skoda Rapid in India. For the ride and handling package, it would be similar to what the hatch achieves and this means a good ride quality and neutral handling. NVH would be nicely damped, though, we personally feel that Skoda do a very nice job of the NVH thing as compared with VW. 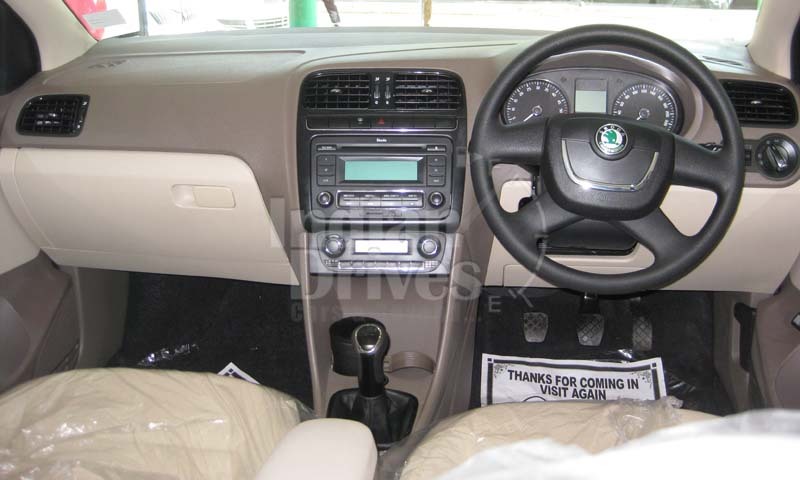 Steering feel would be the same as the Fabia. Heavy localization would however lower costs down and since both the Fabia and Rapid would be rolled out from the same assembly line, costs are expected to be kept down. Regarding engine choice, there is a unanimous thing in the air that the Rapid would share the engines with the Vento, just like the Fabia does with the Polo. This means a 1.6 liter petrol engine producing 106 Bhp of power and 153 Nm of torque. The diesel on the other hand is a 1.6 liter unit producing 104 Bhp of power and 250 Nm of torque. A 5 speed manual is what gives both of these engines company. 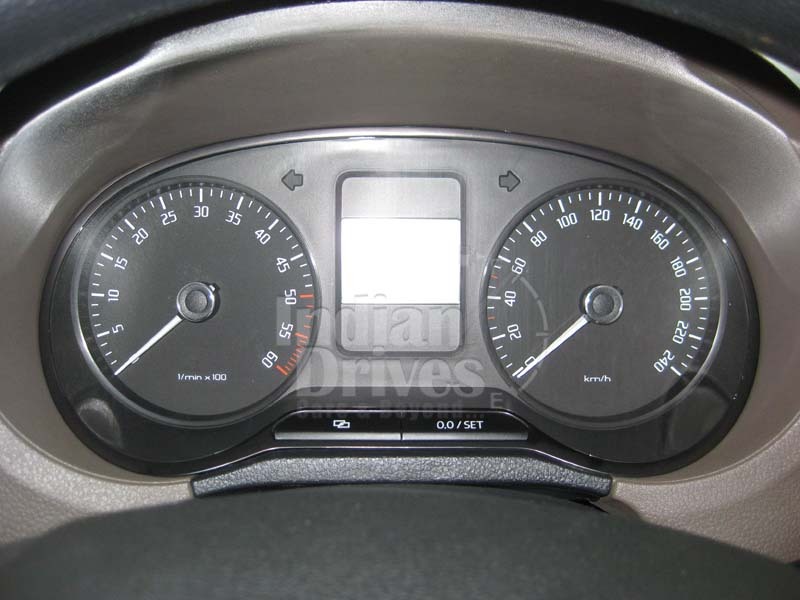 It is highly unlikely that Skoda would offer the Rapid with the 6 speed triptronic option from the Volkswagen Vento. The Rapid’s performance would come up for discussion once the model sees the daylight. Fuel efficiency would be a tad lower from the Vento, as is the case of the Polo and Fabia. This can be attributed to the heavy kerb weight of the Rapid. Braking aids would definitely be present in the form of ABS and EBD. Safety would be the usual fare of 2 airbags in the front unless Skoda plans to pull a hare out of its hat. The Skoda Rapid price in India would start from Rs 5.5 lakhs and end at Rs 6.8 lakhs. 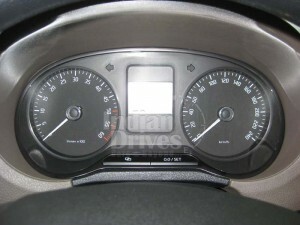 This is an estimate and the exact pricing would only be revealed earliest by October 2011 or at the 2012 Auto Expo. This is one eagerly awaited product from Skoda.